Get great value for money with comprehensive caravan cover from Adrian Flux. 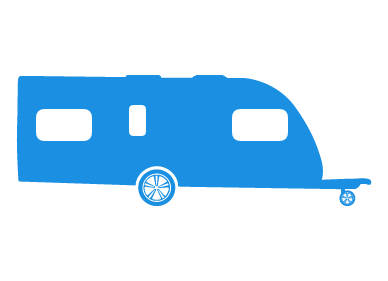 So whether you have a 2 berth touring caravan, an 8 berth static caravan, a large European van or a folding caravan, we have a suitable, affordable caravan insurance policy for you. We search a wide range of specialist schemes to find the most appropriate policy for your needs, for a price that won't break the bank. So why not give us a call for free on 08000 83 88 33 and get a no hassle, tailored quote today. It is not a legal requirement to insure your caravan, so you may be wondering to yourself "Why do I need caravan insurance?" But caravans cost a lot of money to replace, and insurance can be surprisingly inexpensive, so skimping here can prove to be a false economy. All our policies are designed especially for the out of the ordinary and our staff have a high degree of knowledge in this field, which means they can find you cheap caravan insurance, whether you have an imported Hymer or Tabbert van, or if you have a trusty Bailey or Abbey. We offer cover for all manner of unusual and individual caravans, so if you have a classic Airstream, a folding caravan, or a larger imported caravan from Europe, we can help you find the right policy, for the right price. With discounts for members of touring, camping and caravanning clubs, as well as great deals when you obtain your car and caravan insurance together with Adrian Flux, we are confident that we offer some of the best insurance services for UK caravan owners, whether you own a UK model, European or US import. The Adrian Flux team assesses every quote individually, unlike online computer rating systems we calculate each risk and provide you with a quote that is tailored to your specific caravan insurance needs. When you call, your quote will be handled by an experienced underwriter, not just a button pusher, who will search tailor made caravan insurance schemes to find the best policy for you. Quick, cheap quotes by phone - Simply call 08000 83 88 33. Or, if you would like to request a convenient call back, please complete the call me form for an immediate touring or static caravan insurance quote.